More than 350 cracks have been discovered in Hunterston B's nuclear reactor, pushing the total over government safety limits. A smaller number of cracks were already known about but the figure has risen sharply following recent inspections at the North Ayrshire plant. 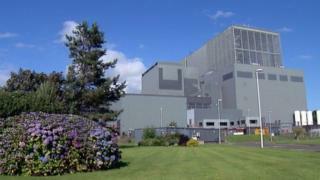 Owners EDF Energy closed the site's reactor three in March this year for more detailed investigation. The firm said the reactor was safe, and it hoped to bring it back into service. A spokeswoman insisted: "Nuclear safety is our overriding priority." The UK government's Office for Nuclear Regulation (ONR) state that 350 cracks is the "operational limit". An ONR spokesperson said: "A conservative assessment of the inspection results shows that the number of cracks in reactor three exceeded the operational limit of 350 cracks in the existing safety case. "However, it should be noted that the safety case demonstrates a significant margin beyond this limit and safe operation was ensured." The cracks sit in the channels of the reactor's graphite core where the control rods slot in to suppress the nuclear reaction and shut down the plant. In a worst case scenario, if there was a seismic event, cracks could distort the channel and potentially prevent control rods from slotting in. The plan is to decommission the plant before that becomes possible. It is currently expected to continue operating until 2023. EDF reported cracks to stakeholders in June but said the damage was "significantly mitigated" by the gaps being narrower than ONR's safety case. The firm confirmed it will present a safety case to ONR to bring reactor three back into operation. An EDF Energy spokeswoman said: "The most recent results support the work we are doing on the long-term safety case and underline our confidence that the normal operations at the station are unaffected and that there would be safe shutdown in the event of a 1 in 10,000 year earthquake. "We are preparing to present a safety case for return to service of reactor three to the regulator, the ONR, for their assessment. "We have also carried out similar inspections on reactor four and the case for return to service for that unit is currently with the ONR for review." Rita Holmes, chairwoman of the Hunterston Site Stakeholder Group, challenged the energy supplier, saying she did not believe reactor three should be brought back into operation. She told The Ferret: "If safety were indeed EDF's number one priority, then reactor three would remain shut down. "As it is EDF is seeking permission to restart an aged reactor, which despite huge efforts and high cost, failed to back up its current safety case. "The Hunterston keyway root cracking was not predicted to be so progressed."